Below 8848 meter, from the top of the World (Everest) , a voice echoed with mouth mummering and teeth biting , on the cell phone... " Helllo Darlling Its me ...I am on the Top of World ". 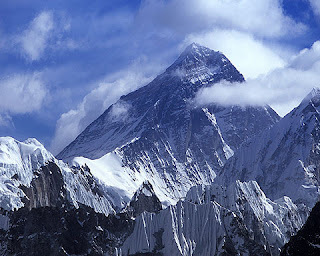 Rob Baber the British mountaineer has become the first person to make a call from Everest. He was so much exiceted that he send a SMS to the Motorolla Company ,who provided him the MOTO RITZ Z8 mobile. I am thinking what type of thrill and exitement will be there ! The -30 degree chilled weather , With the mist of Cloudy fog, surrounding with lust white dense snow forrest, Cold breeze passing by the open cheeks..